One of the joys of retirement is that when something catches your interest you can make the time to chase it around a little and see what pops up. Usually it is a meander through the serendipity of google, a quick check of a fact turning into a couple of hours or so of increasingly unrelated, but fascinating links until you have quite forgotten what you were first enquiring about. My latest musings started by watching Bruce Forsyth’s moving tribute to Sammy Davis jnr on ITV followed by the repeat of a show the pair did together back in the days when television concentrated on real talent rather than cooks, diy experts and wannabes. What did happen to Variety? I was immediately reminded of seeing Sammy Davis at the London Palladium, I guess in the 1970s. It was the most thrilling night I’ve ever spent in the theatre. I’ve been fortunate to witness some memorable entertainment moments. There were stellar nights at Ronnie Scott’s when the likes of Oscar Peterson and Sarah Vaughan performed close enough to almost touch. I sat immediately in front of Fred Astaire at the London premier of the movie That’s Entertainment and watched in awe as he seemed to float down the steps on his way to take a bow at the end. But Sammy Davis topped the lot. Tiny, almost fragile, he was alone on that big Palladium stage but he filled it with his talent. 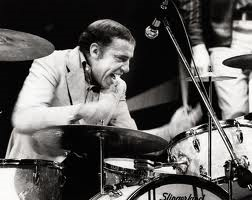 He danced, he played several instruments, he came up with a string of spot-on impressions, and he demonstrated that with the possible exception of his mate Sinatra, there has probably never been a better singer of the great American song book. And I recall noticing that while there was no doubting he was the star, he had a great rapport with and appreciation of the orchestra accompanying him – he clearly loved being among musicians. 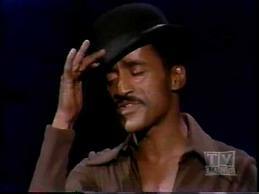 If you haven’t seen Sammy Davis in action I urge you to watch his masterpiece on YouTube, telling the touching story of Mr Bojangles – ‘he looked to me to be the eyes of age’. But before you do, take a look at the version by Jerry Jeff Walker who wrote it. So Jerry’s version should be the definitive performance. Yet to me, while it’s a pleasant enough country song, it’s not something you would immediately think ‘I must put that down as one of my eight discs in case Kirsty Young invites me on Desert Island Discs. But then watch this version by Sammy Davis. He doesn’t just sing it; he doesn’t even just perform it; he lives it. The experience of being on the stage since he was a small boy is there in every immaculate gesture; but so is the pain of all those years when being black meant using the back door and when your so-called friend, John F Kennedy, for whom you had gained so many black votes, refused to invite you to the presidential inaugural ball because the world would not look kindly on a black man married to a white woman. This is a performance of sheer genius – one person described it as music’s equivalent of Olivier’s Hamlet. But be warned once you’ve watched it, you’ll want more and you could find yourself spending hours on YouTube in awe of the many talents of Sammy Davis Jnr.